And then one day, a friend showed up with a croquet magazine complete with eye-opening stories about fancy custom-made mallets and well-tended grass courts in Phoenix. “I just thought, ‘Wow, there’s real croquet out there,’” he says. So he took a two-week trip to Phoenix, and after plenty of play at the Arizona Croquet Club, he returned home with a plan. “It took me a year to sell my house, quit my job and move to Phoenix. My family and friends ─ they all thought I was crazy. But I wanted to go and play real croquet. The bug just got me,” he says. Not exactly a smart career move for a headstrong young man, you say? (“I was 28,” Stark says. “Nobody could really tell me what to do.”) Well, in fact, it was ─ Stark became a professional croquet player. Now 54 and clad in all white, he shrugs his shoulders and smiles. “Yeah, I like to be different,” says Stark from the grounds of Meadowood, an elegant Napa Valley resort where he’s been the resident pro for the last two decades. 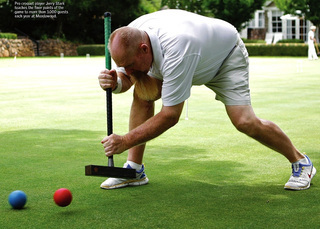 He may not be the first autoworker to take his job and shove it, but he’s surely the only one who found a new life in croquet. And, as congenial a fellow as Stark may be (one friend calls him “a gentle giant”), he’s taken the game by storm. 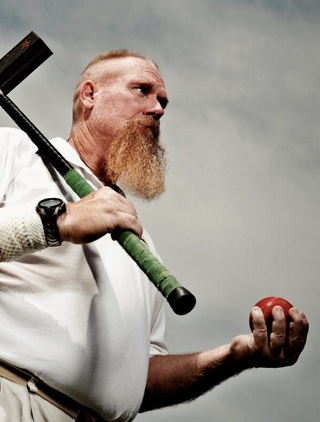 He’s currently one of the top-ranked players in the United States and 56th in the world, has won five national titles, and has even earned a spot in the U.S. Croquet Association’s Hall of Fame.